Andrew Gonzalez, an amateur mixed martial arts fighter and second degree black belt in karate, weighed in on the highly hyped Conor McGregor vs. Floyd Mayweather fight. Esther Lin/SHOWTIME file Floyd Mayweather landing a punch on McGregor during the Aug. 26 fight. Mayweather wore McGregor down and was able to win it in the 10th round..
Gonzalez was one of the many who purchased the fight through pay-per-view and had some friends over for a fight party. Gonzalez emphasized the show aspect of the event. “Bringing in nine-digit figures for both fighters win or lose without anything truly on the line made it a fight where there was none of the anticipation one has when watching Mayweather or McGregor compete in their respective fields,” he said. But regardless, like most people, he had fun. How well did McGregor do? Besides taking home 30 million, Gonzalez said he looked good at the beginning of the fight. Gonzalez said he even gave McGregor the first three rounds. 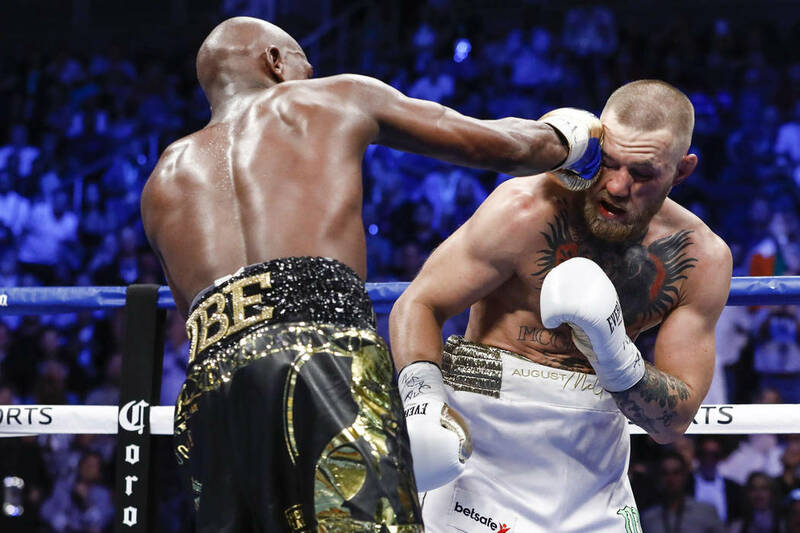 “He came in strong and it looked as if he was giving Mayweather a run for his money, but Mayweather was simply reading his movements and getting used to McGregor’s rhythm,” Gonzalez said. Gonzalez said things started to change in Mayweather’s favor as early as the fourth and fifth rounds. This was when Mayweather started wearing down McGregor. Gonzalez gives rounds six through 10 to Mayweather. Gonzalez said he can see that Mayweather was very sharp through his eyes. McGregor started to lose focus and that was in his eyes too, according to Gonzalez. Should the ref have stopped the fight? Overall, Gonzalez feels the fight was an entertaining one. Was it a competitive match and is McGregor a boxer?